Their films allow poetry to speak out, and arouse this very emotion which awakens awareness and joyfully nurtures us. Marie-Clémence and Cesar Paes make committed and serious statements, but doing so, they put us into a half-awoken dream where it is not essential to grasp at things at once, since the presence of the people, the colour, the rhythm and the relevance of their discourse will remain within us, since the traces left by their films are working underground and, suddenly, question us with a healthy disturbing shivering. The approach chosen by the Paes is based on respect for the subject, and the time they take to get closer, to listen, can fundamentally be found in their restitution of reality. Since their films mainly focus on oral literature, cinema stands as the only suitable support to rightly transmit the words of the story tellers, allowing the free flow of their imagination, of our imagination. Under the Paes eyes no trace of exoticism can be found, they train our own eyes, encouraging us to move out towards the other one and move inside within oneself. They simply make us a little more sensitive, more open, a little less cartesian. Marie-Clémence & Cesar Paes . 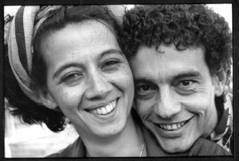 She is both French and Malagasy, he is Brazilian and French. They make feature length documentaries where music is a way to explore serious topics and fight against clichés. Their previous films such as "Angano...angano...tales from Madagascar" or "Songs and Tears of Nature", “Awara soup” have won top awards at Cinema du Réel, Festival dei Popoli or Leipzig and been screened by broadcasters such as Arte, WDR, WNYC, Canal+, SVT or even Taiwan public TV. Their feature length documentary "Saudade do futuro" won the Audience award at the Rencontres internationales de Cinéma (Forum des Images). “Mahaleo” has won a SCAM Star in 2007, and was co-produced by ARTE France cinema with the support of Canal +. They both have been theatrically released in France and in the USA (Film Forum). The most recent film is "An Opera from the Indian Ocean" , actually theatrically released in France . The DVDs and original soundtracks of the films are available here ..